An excellent model from the Whizzwheels era that was only available for a short period between 1970 and 1972. 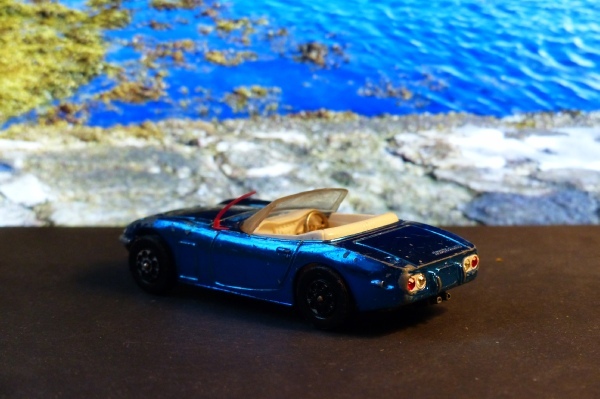 Using the James Bond cast from #336 this has shiny blue paintwork - the sort of mirror finish that Corgi were doing at that time with the Corvette. There is also a rare purple shade. This blue is pretty hard to find so good luck tracking down a purple one. Although it sports the same old wheels, there are lovely jewels front and rear, especially at the rear and a classic Corgi interior. This example is in reasonable condition with an original aerial. The paintwork has quite a few marks although, because of its colour and texture, that’s not obvious on display. It is missing both front jewels. In fact it looks as if it has never had them! That might even be a genuine variation! At this time there are so many little differences I am finding as the various elements were transferred or not to the Whizzwheel versions of existing models. Like so many Whizzwheel models the suspension is almost non-existent but this really doesn’t detract from an otherwise fabulous car but I can’t ask much for it.